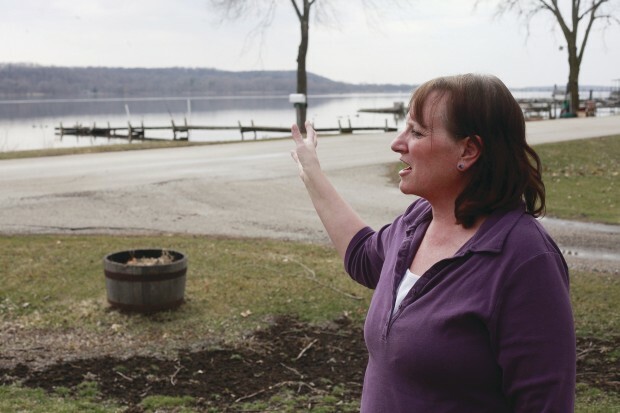 Lisa (Coborn-1979) Piatt, of LeClaire Iowa., gestures toward the Mississippi River on Sunday, March 20, 2011, as she talked about the potential for her house to flood in LeClaire, Iowa. Piatt is packing up her home and moving in with her landlords in anticipation of flooding in the Quad-Cities. A LeClaire, Iowa, woman is packing up to move out of her rental home in anticipation of flooding in the coming weeks. Lisa Piatt and her dogs, Scuby and Rebel, plan to move in with their landlords, Kim and Cathy Gibson of LeClaire, by April 1. Piatt has lived in the riverfront cottage near Lock and Dam 14 in the shadow of the Interstate 80 Mississippi River bridge for almost two years. She said the Mississippi River always has made her nervous. She was reluctant to move to a place so close to the water but has been soothed by what she calls her “million-dollar view” and the pleasant, quiet walks she can take with her dogs at night. Nevertheless, she and her landlords have been keeping a close eye on the flood predictions for the last month. “The yard floods just from the rain, so we’re getting ready,” she said. According to the National Weather Service, the Mississippi River will be getting close to flood stage by Sunday. Piatt is taking the whole moving process slowly. She acknowledges that it may be several months before she is able to return to her house if it does flood. Kim Gibson said the house flooded in 1965, 1993 and 2001. The Gibsons, who have owned the house for almost eight years, have been watching the river, which flows by about 50 feet from the front porch of the house. Kim said she didn’t hesitate to offer Piatt a place to stay. “She’s my good friend, and we take care of our friends,” she said.